Describing Africa as the "next global frontier for investment," Ramaphosa said: "May the deals be concluded. May we all be part of the deals that are going to be made here." Four African Heads of State - President Alpha Conde of the Republic of Guinea; President Macky Sall of Senegal; President Nana Dankwa Akufo-Addo of Ghana and President Sahle-Work Zewde of Ethiopia, made the trip to South Africa for the Forum. Other officials included the Vice President of Nigeria; the Prime Ministers of Rwanda, Edouard Ngirente and Cameroon, Philémon Yang, as well as ministers representing the Kingdom of Morocco, Cote d'Ivoire, Tanzania, Niger, and Gabon. In attendance also were Governors and Board members of the African Development Bank. In his opening remarks, Adesina lauded the "impressive gathering" of stakeholders, indicating that their "presence here shows you care about Africa, and that you have confidence to take up more investments in Africa." Giving an overview of existing opportunities in the power and agriculture sectors, President Adesina said: "we always asked what's the next China after China? Well, appropriately, China figured it out. It's Africa." Adesina said, "But it's all about how you see it: a glass half empty or a glass half full. Let's see the challenges as a glass half full. That means Africa has an investment opportunity of $68-108 billion a year for infrastructure alone." "Which continent will have consumer and business expenditures that reach $5.6 trillion in just 7 short years," he added. "Don't think far: think Africa!" The power sector alone provides a US$30 billion annual investment opportunity, tapping into Africa's vast resources of gas, solar, hydro, wind and geothermal. Huge investment opportunities abound to make Africa the leading region on renewable energy in the world. 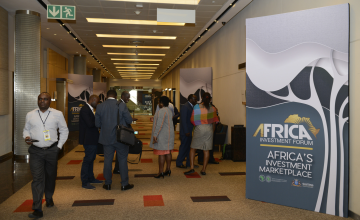 At the Africa Investment Forum, 306 project transactions valued at US$208.8 billion have been developed. Over the next three days, 60 projects and deals worth US$40.4 billion will be discussed in Boardroom sessions by investors and promoters to fast track closure of deals or to remove policy and regulatory constraints to deal closure. An additional US$28 billion of projects will be showcased in "gallery walks" which have yet to move to boardroom investment conversations. Over 330 investors will be in the Boardroom investment conversations and "I must say the demand by investors has been overwhelming, so much so that 92% of the investments Boardrooms have been oversubscribed.That's remarkable for a first inaugural investment forum," Adesina said.